In September 1897, only a few years before this card was published, the first steps towards enlarging the Parish Church to mark Queen Victoria's Diamond Jubilee had got underway. "On Wednesday afternoon the ceremony of laying the foundation stone of the new aisle and chapel to be erected in commemoration of the 60th year of the reign of Her Majesty the Queen took place" ... the weather was "very unpropitious". The Ven Archdeacon of Derby performed the service. The architect who was appointed was Percy H Currey of Derby and the work was to be undertaken by local tradesmen. The accommodation was to be increased by about 140 and the sum of £1000 had already been raised to pay for the alterations. This project was completed in 1898 but the fundraising continued for some time afterwards. Unfortunately, the church was broken into in March 1900; the two offertory boxes were forced open and their contents taken. One box was for the restoration fund and the other for the poor; the former box had not been opened for the 12 months it had been in the church and was believed to contain a substantial amount of cash. The burglars had cut through the diamond leaded windows on the north side of the church. The 1897-8 alterations included extending the south aisle, adding the south chapel and slightly altering the church porch. In addition, "the arch over the organ chamber was raised, a window was removed on the south side of the chancel and the the corresponding arch to the south chapel was formed". Pushing back the back choir stall and slightly rearranging other stalls increased the available space in the chancel. Before 1897-8 the chancel walls were rough and undecorated, but the church was able to use the skills of Mr. A. O. Hemming of London to smooth down the walls as he was already working at Cromford church. Black and white polished marble paving was also installed in the chancel at this time, paid for by the Statham family as a memorial to their parents. The picture was taken from just inside the main gate and shows us a full graveyard round the church; this is where many of the older headstones are. Nowadays many of the inscriptions have been worn away by weathering, as can be seen in a modern photograph if you click on the link to St. Giles' Church below. But one can imagine that when this card was taken over 110 years ago the headstones would have still been easy to read. It is interesting to see the large chest tomb on the right with its railings still intact. During the wars railings were removed from many places and were melted down. The postcard has a writing strip on the front right hand side, though it has not been included here. This strip was intended to be used for the message, and only the address of the recipient could be written on the back of cards at that time. Whilst some printers and publishers continued using the side message strip until about 1910, its usage had mostly stopped in 1904 as people were allowed to write the message and address on the back of the card from then onwards. 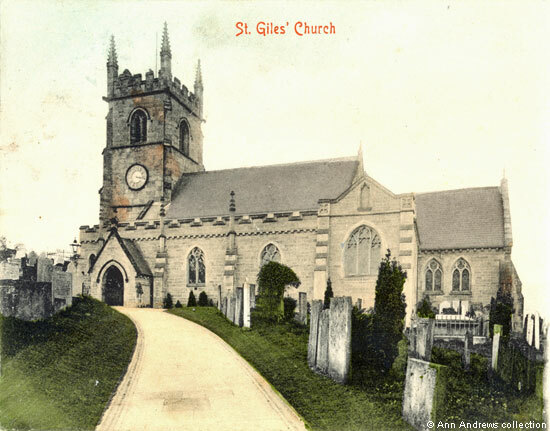 "St. Giles Church, Matlock". Published by Stengel & Co. Ltd., 39 Redcross Street, London E. C., No. 16038. Printed at Works, Dresden. Posted in 21 Dec 1904 at Matlock Bridge. another was posted in 1903. Undivided back, so no message on the card. Postcard in the collection of, provided by, researched by and © Ann Andrews. This iImage replaces an earlier version of the card. "The Derby Mercury", 8 Sep 1897. Bryan, Benjamin (1903) "History of Matlock - Matlock, Manor and Parish" London by Bemrose & Sons, Limited. Bryan identified the Stathams who gave the marble floor as Mr. & Mrs. N. Statham; he presumably meant the photographer William Nathan Statham and his wife.